Are you familiar with the term, “velocity of money?” You’ve maybe heard it said that a dollar changes hands roughly seven times before it parks in a savings account or a long-term investment. Velocity is the relative speed at which the changing happens. A dollar that enters the community in January and circulates through six other hands by April is evidence of a very different economy than one which enters in January and finally parks in August. Right now, money is changing hands at the slowest rate in decades. Unemployment is high, but employment is still much higher. For every person without a job in this country, seven are still working, still wearing out clothing, putting miles on cars, buying groceries, paying rent, and tithing to their churches. They’re still spending, but at a greatly reduced velocity. The people who are spending are carefully considering each purchase. They’re not buying cheap. They’re buying value. Cheap is price compared to other similar offerings. Value is actual price compared to expected price. There’s a major flaw in his thinking. High net worth investors already have a broker, or a fund manager, or a financial analyst. The professionals they choose to work with were carefully vetted before the relationship got underway. And, should they ever become disillusioned with their current advisors, they will look for someone who offers a greater value than the current advisor does. What value does our stockbroker friend offer investors? Pretend you are a high net worth investor, and you have a $2 million portfolio. Will you trust your money to an advisor who’s clients are primarily in the $250,000 range? Or will you want to be the smallest account managed by an advisor who’s average client has a $200 million portfolio? There’s an implied competence in someone with whom much bigger investors have already trusted their money. As the new guy on the block, if you’re not already working with those clients, you’re going to have to offer something other advisors don’t. Can you be the only advisor who meets with his clients quarterly, or semi-annually to re-evaluate their immediate and longer term goals? In a rapidly changing economic landscape, frequent attention may be of value. Can you be the advisor who out performs the market by three or four points? Can you do it consistently? Can you offer proof of that? Can you specialize in super-serving a niche market? Self-employed professionals? Single women? Law enforcement employees? What does your understanding of their specific circumstances ad to your value? Value – the operative word for the decade. Are you in retail? Do people come to you to shop? What do your customers get that no other retailer offers them? Do they recognize that value? Could you articulate it in two or three sentences? Are you a service professional, selling your plumbing, painting, or air conditioning expertise? Why would a customer find your service more valuable than other service professionals? Can you explain that in a typical elevator speech? Do you operate your own professional practice? What can your architectural clients, your dental patients, your legal clients expect you to provide that other professionals don’t offer? Do they already understand your value? How do you know? Its a critical question for the next decade. People are still spending. They’re not looking for cheap. They’re looking for value. Without it, you’d best hunker down and hope you can keep enough cash coming in to keep the doors open. If you have real value, but need help explaining and projecting that value to the marketplace, my direct number is 304-523-0163. The ability to state it simply, and to communicate that value to your potential customers is critical in this decade as you fish for customers. Got questions about articulating your value, and making sure people know it? 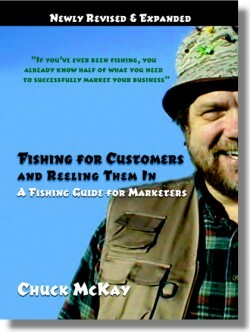 Drop Chuck a note at ChuckMcKay@ChuckMcKayOnLine.com. Or call him at 304-523-0163.